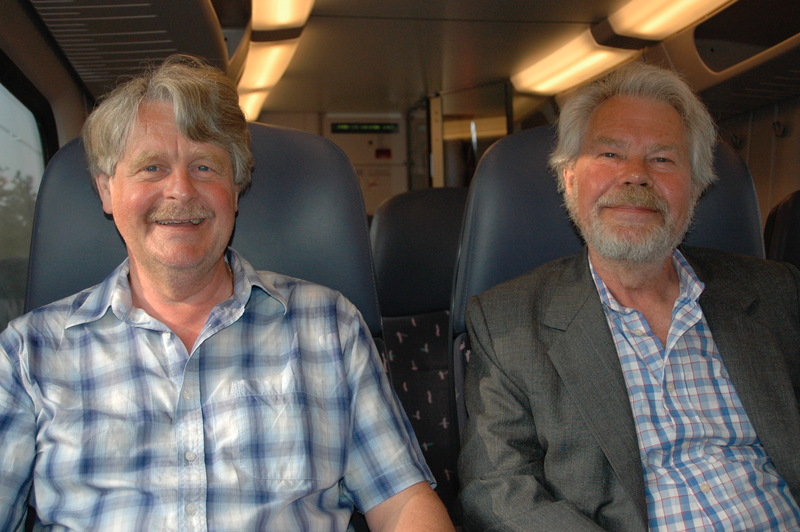 It came as a shock, when it was announced that my best friend Professor Emeritus Staffan Lindberg had passed away on Monday, January 7, 2019. 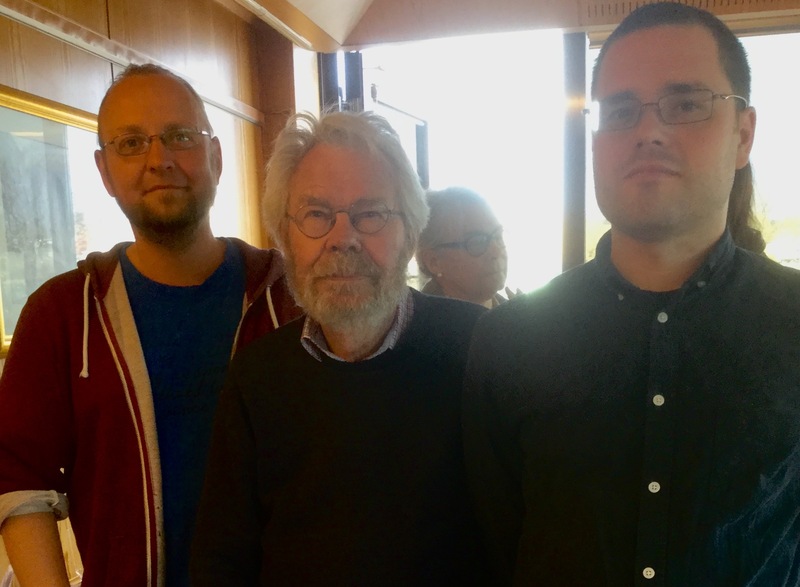 Staffan, who has been one of the foremost India experts in Sweden and also a well-known name among social science researchers in South Asia, had recently returned from a conference in Bangalore along with his wife Karin. For some time he was somewhat sickly, so he was hospitalized in the home town of Lund for observation. There he suffered from cardiac arrest and attempts to resuscitate failed. An appalling ending to Staffan's life, which for over 50 years was characterized by India-related studies, research and teaching. He died far too early, 75 years old. I myself have worked with Staffan for 40 years, first with the journal SYDASIEN – which Staffan was one of the initiators of 1976, then with the academic network SASNET (Swedish South Asian Studies Network) which Staffan led from the start in 2001, and during the last two years, Staffan and I have worked with Miraklet Indien och dess Baksida, a book that was published as late as spring 2018. Staffan's first meeting with India was in the fall of 1966 when he as a student in sociology and comparative religion at Lund University went to Tamil Nadu in southern India to study the Tamil language at Annamalai University. He continued in the spring of 1967 to study rural development at the P S G Arts College in the city of Coimbatore, where, as a field work, he made a study of life among 415 low-pitched, for example, untouchable families. These were employed as agricultural workers but lived a miserable existence as a result of the then-ongoing mechanization of agriculture. He returned to Tamil Nadu a few years later, now together with his colleague Göran Djurfeldt and to Thaiyur, then a village just south of Chennai – now part of large-Chennai - for a sociological research project which in 1976 resulted in a joint doctoral thesis whose content reflected the prevailing caste-based social structure in a South Indian village, but also in an excellent way, addressed the meeting between traditional and Western medicine in India. It became two books, Behind Poverty: The Social Formation in a Tamil Village, and Pills Against Poverty. A Study of the Introduction of Western Medicine in a Tamil Village – the latter also translated into Swedish. Books that have become standard literature on academic education both in India and in Sweden. The two researchers worked with Indian colleagues all the time - especially with Professor Venkatesh Athreya at Bharathidasan University in Tiruchirappali – and together with them, Staffan and Göran returned several times to their field areas and did comparative studies. One was done in 1995, 25 years after the original field work. Staffan and Göran wrote about this in SYDASIEN No. 2/1995, an article titled Back to Thaiyur and a welfare "Indian style". 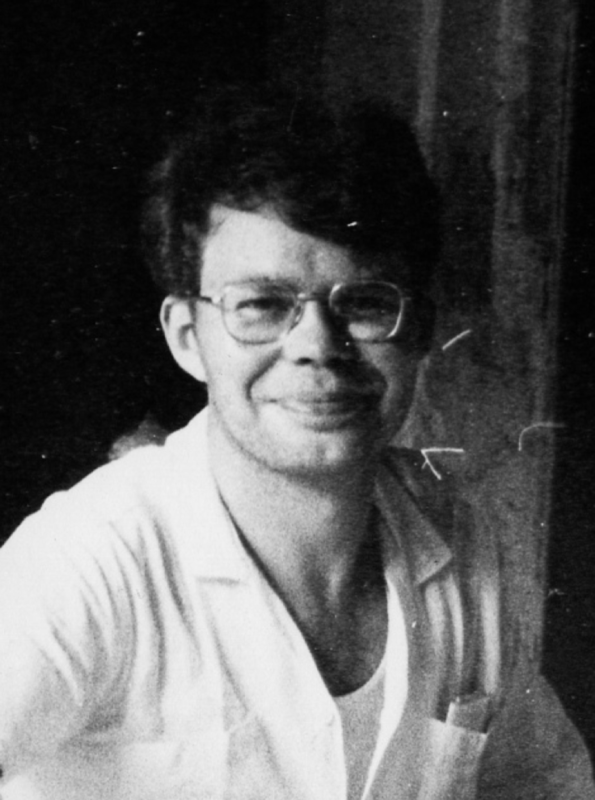 http://larseklund.in/SYDASIENsidor1977-2007/1995-02.pdf. They then continued with a large Sida-funded research project on production conditions in Indian agriculture, a project conducted in 1979-1986 and included a study of 400 farmers in six villages in the Tiruchilappali district in central Tamil Nadu. The villages were located in two very different ecological environments, one with access to irrigation and thus providing several crops per year, and the second so-called "dry" villages totally dependent on rainfall. The results were summarized in a monograph titled Barriers Broken – Production Relations and Agrarian Change in South India, published in 1990. In addition to Venkatesh Athreya, the project included Indian research colleagues Dr R Vidyasagar from Madras Institute of Development Studies and Dr A Rajagopal from SaciWATERs in Hyderabad. 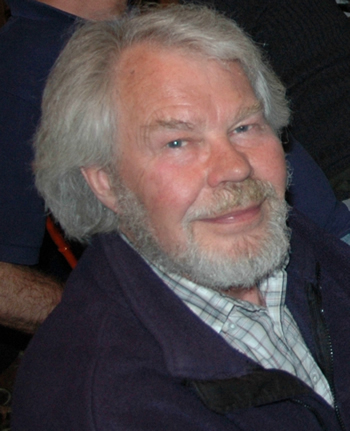 Although Staffan later also conducted research and field work elsewhere in India, for example in Punjab and has been a visiting professor at Lal Bahadur Shastri National Academy of Administration in Mussoorie, and has researched in other countries such as Thailand and Taiwan, the first-year experiences in Tamil Nadu came to characterize the rest of his life. He constantly stated that the friends he got there and then remained his most loyal friends throughout his life, and the fact is that it was precisely those he had the opportunity to meet during the last trip to India in December 2018. An important reason for launching the magazine was the state of emergency in India by Indira Gandhi in June 1975, imprisoning opposition politicians and launching a campaign of forced sterilization of the country's poor population, but also the political situation in neighboring Pakistan, Bangladesh and Sri Lanka engaged many Swedish journalists, researchers and development assistance workers. For many years, the newspaper was produced by three partially independent editorial committees in Stockholm, Gothenburg and Skåne, which were about to make a magazine in turns. 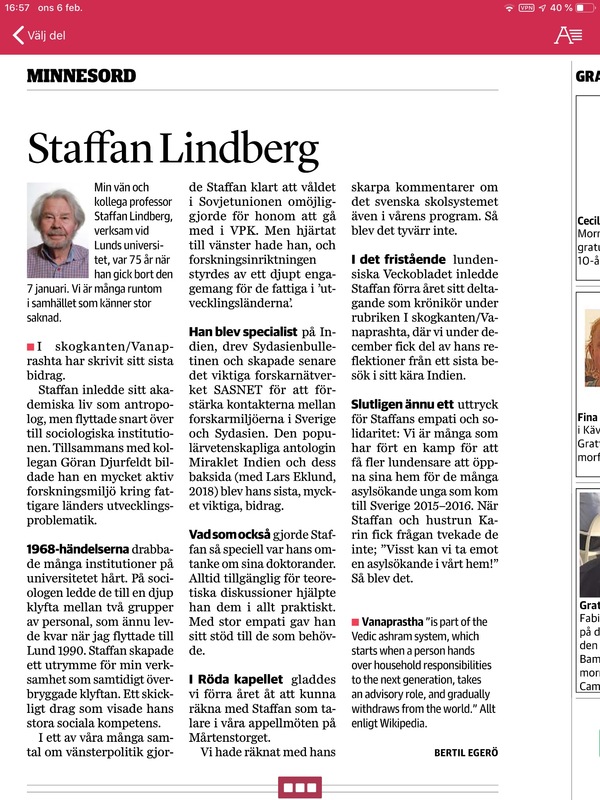 Staffan was a leading member of the Skåne board while I was part of the Gothenburg editorial board, while I also had an overall editorial responsibility for the newspaper for 25 years. 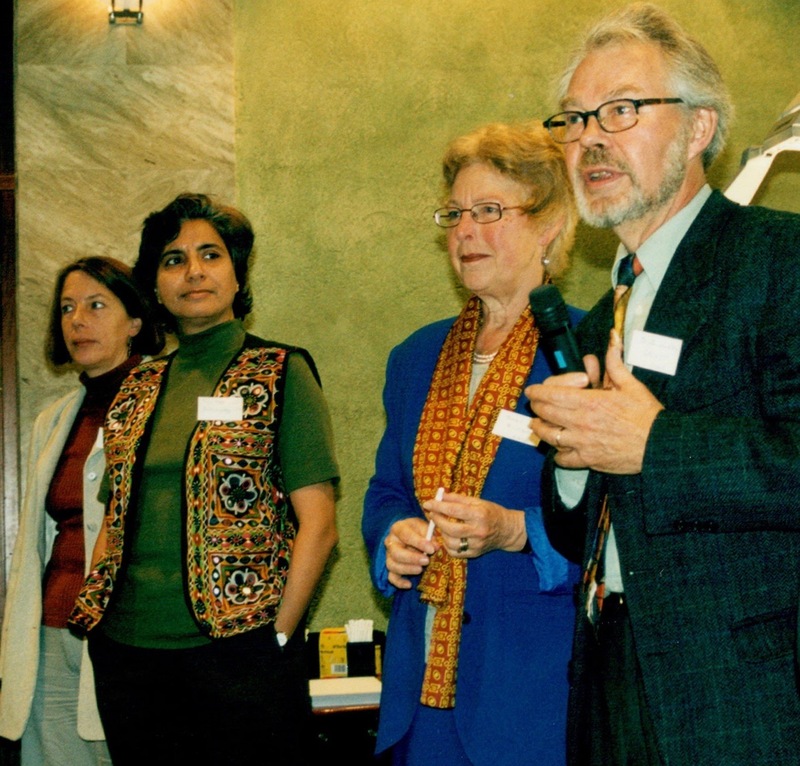 When it became clear in 2000 that Lund University was commissioned by the Swedish government through Sida to launch a network for South Asia studies in Sweden, what became SASNET, it was entirely Staffan's merit. It was his thoughts not to let the network mainly consist of a physical center formation in Lund, but instead to build on and develop the overall South Asian competence that already existed at the Swedish universities that won hearing. It turned out to be an excellent idea, which Sida expanded into more similar academic networks in the following years. In addition, Staffan's model was based on the fact that the network would have a very limited amount of staff, and instead let up to half the budget go to finance planning grants for new South Asia-related education and research projects at all Swedish universities, thus no priority for just Lund University. Staffan was naturally given the role of director of the network, but his vision of realizing a national web-based network assumed a combination of academic and journalistic competence, and that was why Staffan made sure to enroll me as a webmaster and assistant director. Thus, at the same time utilizing the vast network of Swedish and Nordic researchers and journalists built around the journal SYDASIEN. SASNET started in January 2001 and during the following years Staffan and I diligently went to the Swedish universities, met with researchers and administrators and thus built up an impressive database of in-depth information on South Asia-related research in all disciplines from medicine and technology to the humanities. and social sciences at all Swedish universities. And the possibility of applying for planning grants meant that SASNET became a popular institution throughout the country. Our ambition to let the network reflect the country's overall South Asia-related research and in our newsletters informing about interesting research at all Swedish universities was unique. In other countries, a university does not tell about news at competing universities, but in Sweden we did just that. Our newsletters were internationally recognized and many got the illusion of believing that Lund University must be a leader in European South Asia research. This false image – Lund has very few researchers working with South Asia compared to the major centers in Europe such as Heidelberg, Leiden, Paris and London – however, put Lund on the map and led to Lund University being accepted as a partner of the major universities in organizing research seminars and in 2004, Lund University was given the prestigious assignment to organize the 18th European South Asia Research Conference ECSAS with 400 participants from all over the world. Staffan was the given conference general. 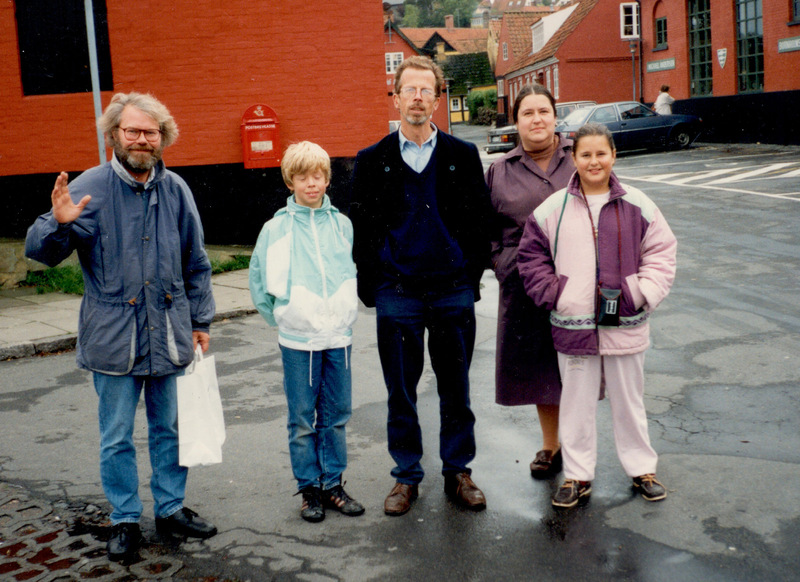 Of course, after his retirement in 2007, Staffan continued to take an interest in South Asia, but he devoted more time to his family - his wife Karin, his sons Mattias, David and Mikael and grandchildren, as well as his many friends. He also developed other areas of interest, sang with the choir Svart på Vitt, learned to play accordion, served as a church attendant in Allhelgonakyrkan, led for a number of years study circles about the city of Malmö, and as the extremely kind-hearted person that Staffan he engaged himself strongly in assisting newly arrived refugees from the war in Syria. Last two years we worked again with an India project. Stig Palmkron, book publisher in Lund, contacted Staffan and said that he lacked a modern Swedish language popular scientific book about India that addresses both positive and negative phenomena. Of course, many good books have been published in Swedish about India in recent years, but it is mainly report books and travel books. The most recent general book releases were in the 1980s. The excellent anthology of Indien - en Handbok was published in 1985 and two years later, in connection with the Indian festival in Sweden came the equally readable anthology Möt Indien. Palmkron was interested in paying for the release of a new anthology and Staffan accepted right away and then contacted me to plan it all together. We contacted a number of well-known researchers in Sweden, Denmark and Norway and wondered if they were interested in participating with chapters. Some were already heavily tied to other projects and declined participation, but in the end we had put together a group of talented writers to write about India's democracy and also its lack of democracy in parts of the country, about the situation of women, about India's great power dreams, about Indian religions, etc. Staffan himself took hold of writing about the country's history and environmental problems, while I wrote about cultural life. The title of the book reflects the content, the Miracle India and its backside. Finally something about Hedgården, Staffan's beloved house in Österlen. A fantastic house that once stood in the village of Knäbäck 20 km further north, but which was moved when Ravlunda's shooting field despite violent protests was built in the mid-1950s. The entire village Knäbäck was wiped out, but a large part of the picturesque houses were moved to what is today Knäbäckshusen near Rörum. Staffan's father who was a priest bought Hedgården and eventually the house was taken over by Staffan and one of his brothers. In 1968, a tradition of so-called potluck parties began when Staffan invited all his friends every year and those who could come were generously welcome to show up for a program that for many years included initial fireball tournament, then potluck dinner, campfire on the beach, overnight stay in house or in tents and finally a walk to Stenshuvud the following day. Knäbäck parties happened every year on the first weekend of June, and the original friends were eventually supplemented or replaced by children and grandchildren. Unfortunately, 2016 was the last time Staffan was the host of the potluck party. For on March 27, 2017, Hedgården burned down. A spark from the wood stove had ignited the straw roof and despite the efforts of several fire brigades, the house did not go to rescue. The fire took Staffan hard, and in 2017 and 2018 no party could be implemented. 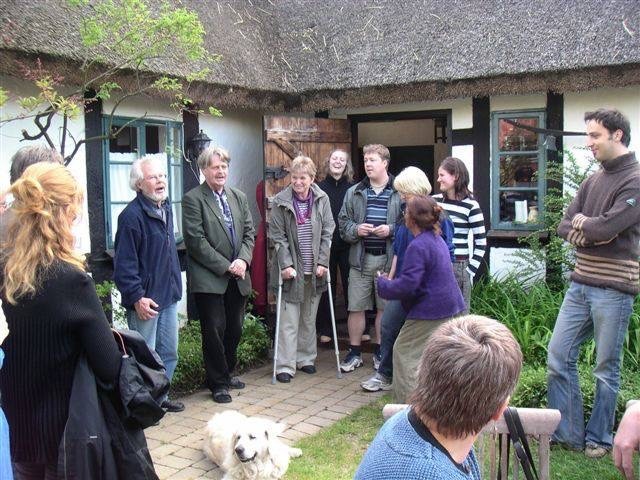 However, the family allowed the house to be re-erected – without a straw roof – and it was finished last autumn, with the intention of allowing the house to be re-opened and again holding the potluck party in June 2019. So maybe it will – but without the host Staffan. Terrible that you are no more, we grieve you so much, all your friends. 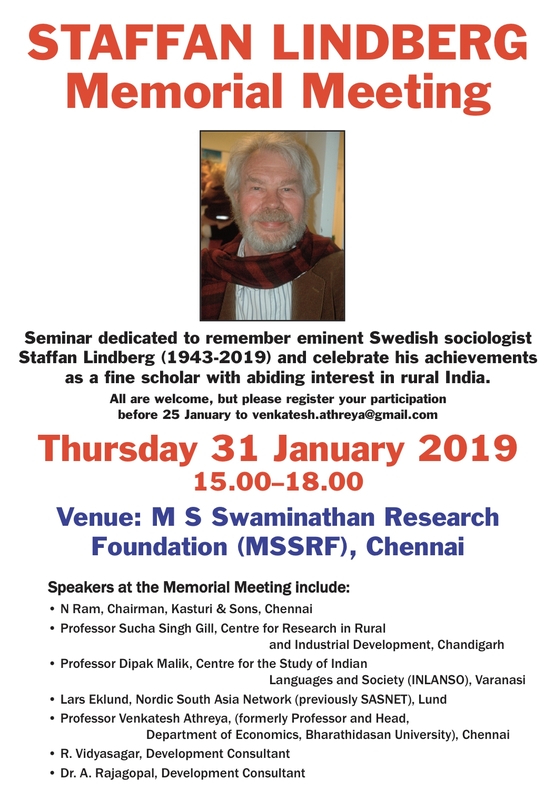 The Memorial meeting for our dear Staffan took place in Chennai on January 31, 2019. It was a very emotional meeting at which every speaker starting with N.Ram of The Hindu spoke of Staffan's sterling qualities as a human being, of his long association with India and Tamil Nadu, and of his impressive professional achievements as a sociologist, as an academic and as a key figure in the development of a network of academics from Sweden and South Asian countries working particularly on rural transformation in South Asia. Ram recalled the nobility of Staffan and Goran in deciding to help out the people of Thaiyur near Chennai where the two were doing field work as part of their dissertation requirements when the village faced a severe drought. I naturally recalled my long professional and personal association with Staffan, marked by deep affection and respect for each other and our shared values, as well as the generous hospitality and warmth of the entire Lindberg-Persson family of which I was a privileged recipient. 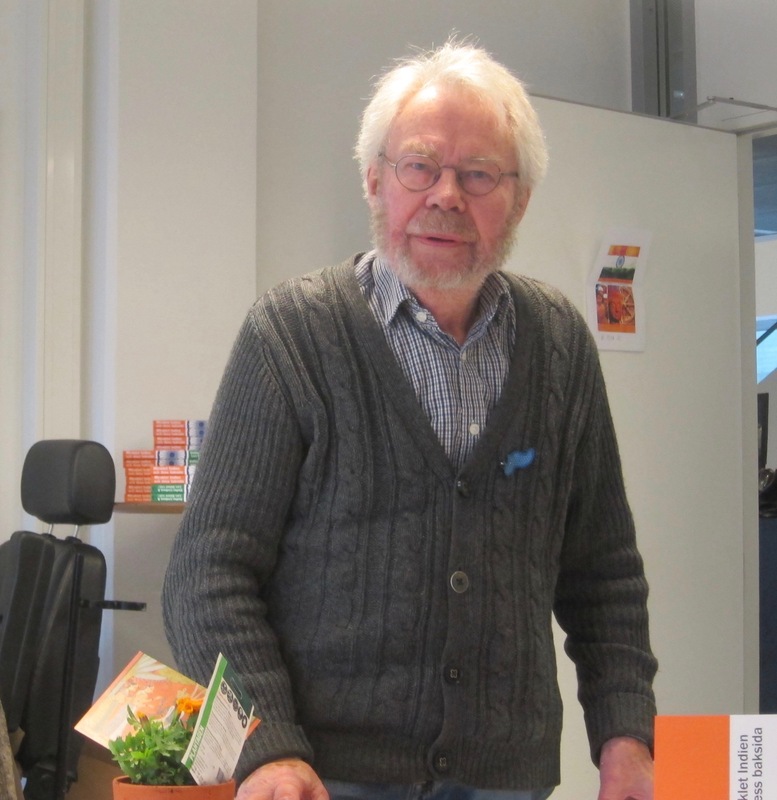 Lars Eklund recalled Staffan's remarkable achievements as the Founder Director of SASNET and his contribution to Sydasien bulletin, of Staffan's dedication to work and of his fine qualities as a human being. Sucha Singh Gill recalled his close bonds with Staffan and explored in some depth the issues facing the farmers of India as well as other segments of the working people in rural India, recalling the profound insights that Staffan had on these issues. Dipak Malik highlighted Staffan's deep empathy for the people, and especially for the rural poor, and his warm and affectionate nature. Göran Frankel, Kasturi (who knew Staffan from 1966), Vidyasagar and Rajagopal also spoke of Staffan , his professional work, his fine qualities and of his impact on their lives. Brinda and Chelliah who had worked in the PRIA project were also present. Also present were Miriya Malik, Amala Frankel and Bubu Eklund. My daughter insisted on being there at the meeting, with her one year old daughter Shambhavi slung over her shoulder, as did my wife Chandra. Chandra, Brinda and Poornima were all recipients of Staffan's affection and were very fond of him. Gopal Karanth and Surinder Jodhka who could not be present on account of prior commitments had also conveyed their fond memories of Staffan which I shared. The very moving message from Karin, Mattias, David, Mikael and other members of Staffan's family was read out in the meeting. Likewise, the warm and very meaningful messages from Göran Djurfeldt, Partha Mukherjee, Barbara Harriss-White, Judith Heyer and Prof M.S. Swaminathan were also read out, and much appreciated by all present. Bubu sang a wonderful and moving Bengali song on friendship towards the end of the meeting. The Meeting concluded with a minute of silence being observed in memory of Staffan.